This June, we had the pleasure of welcoming piano teacher Ms. Ran Jiang to our school. 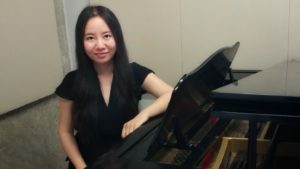 Ms. Jiang completed her Master’s degree in Music Education at Western University. As an RCM certified piano teacher, the member of Ontario Registered Music Teachers’ Association (ORMTA), and the founder of Piano Gamification, Ran believes that teaching piano is all about bringing students to the enjoyment of music and making achievements. Ran is also a solfeggio and theory instructor. We are excited for the knowledge and love of music that Ms. Jiang will bring to our community.